The take home is something that is becoming better understood. Something approaching a vegan diet suppresses cancer risk significantly. Whether going vegan is totally correct or not is another matter but the high level of plant intake appears to be firmly indicated. What is key is that the plant intake suppresses the failures of other goods. So actively blending them into your diet is strongly indicated. And yes, skip the wheat while you are at it and you are likely good to go. As more and more of these studies are been done we are developing a body of work that is slowly reshaping our diet. Often the reaction is over the top but that is easily balanced. The fact remains that a lot of our food choices are a very bad idea in anything but rare treats. Too rich remains too rich and implies rare small portions. What is so hard about obvious common sense? (NaturalNews) Pancreatic cancer is a particularly deadly form of the disease that takes the lives of nearly 40,000 people in the US each year. Mortality rates for pancreatic cancer are high (five year survival rate is less than three percent) as the disease is typically not suspected or diagnosed until it has progressed to an advanced stage and metastasized to other major organs. 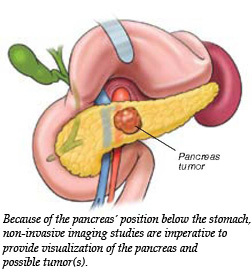 Similar to other cancers, pancreatic cancer develops as a result of dietary digressions after the large exocrine gland fails to meet metabolic demands from a diet high in processed, hormone-infused animal protein, hydrogenated fats and sugar. Researchers publishing the results of a ground breaking study in the British Medical Journal, GUT found that increasing dietary intake of the antioxidant vitamins C, E, and selenium could help cut the risk of developing pancreatic cancer by up to two thirds. Although the study is observational in nature and can only suggest an association, not a cause-and-effect relationship, researchers believe following a diet with optimal intake of the nutrient trio could prevent eight percent of pancreatic cancer cases. To conduct the study, researchers tracked the health of more than 23,500 individuals, aged 40 to 74 years who had entered the EPIC study between 1993 and 1997. Participants completed a comprehensive food diary, detailing the types and amount of every food they ate for seven days, as well as the methods they used to prepare it. Dietary nutrient values were calculated using a specially designed computer program. After 10 years, 49 participants (55 percent of whom were male) had been diagnosed with pancreatic cancer. By 2010, the number of participants diagnosed with pancreatic cancer increased to 86 (44 percent were men). Due to the extremely high mortality rate associated with this invasive form of cancer, patients averaged a six month survival rate after diagnosis. The nutrient intakes of those diagnosed with the disease were compared with nearly 4,000 healthy people to see if there were any differences. Researchers found that a weekly intake of selenium in the top 25 percent of consumption roughly halved their risk of developing pancreatic cancer compared with those whose intake was in the bottom 25 percent. Participants with the highest intake of all three nutrients (vitamins C, E, and selenium) were 67 percent less likely to develop pancreatic cancer than those who were in the bottom 25 percent. Dietary antioxidants are the cornerstone of cancer prevention and must be consumed daily from a variety of freshly prepared foods to dramatically limit the risk of pancreatic cancer and other deadly, chronic diseases.